Grand Opening in June 2019! Welcome to Tropical Trails Resort, the Rio Grande Valley’s newest resorted located near the most beautiful beaches on the Texas Gulf Coast. Escape for a weekend, a month, or an entire winter to enjoy subtropical relaxation, whether exploring the local attractions, experiencing the local culture, or enjoying the secluded accommodations and amenities of the Resort. Ideally located in Brownsville, Texas, the Resort provides the perfect “hub” for local activities or events. Our concierge staff is here to help plan your perfect trip, and our shuttle is available to provide transportation to events and day or evening trips. The options are endless – a short drive to South Padre Island, the most beautiful beach in Texas, to soak in the sun by day and experience the warm hospitality of the nightlife; a day trip to Mexico; local shopping, dining, museums, and historical sites; numerous hiking or biking trails through wildlife preserves and bird watching sanctuaries; and the best fishing in Texas! Call today to confirm your reservation at (855) 684-2887 or Reserve Online Soon through our secure online reservation service. We look forward to providing you an experience in true Texas hospitality. You can completely relax and enjoy your stay! What is it that makes Tropical Trails resort different from all other resorts in the Rio Grande Valley? It is the pristine accommodations coupled with the high-end amenities, providing guests with a true luxury resort experience. Spend the day sunbathing in our resort-style swimming pool, practice your golf swing, enjoying the sports courts, or spend time with your furry friend in one of our pet parks. Tropical Trails Resort offers something for everyone! 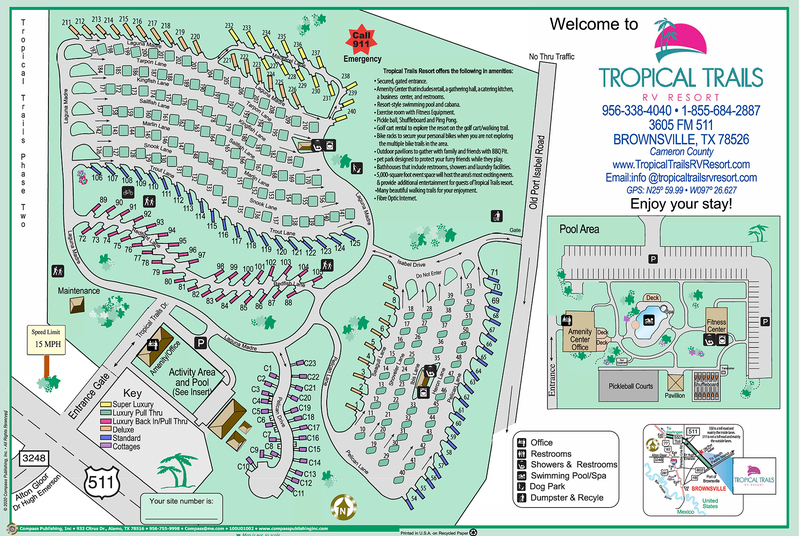 Tropical Trails RV Resort offers something for everyone in accommodations! Upon completion of Phase I in January 2018, Tropical Trails East will offer 71 deluxe RV sites that will cater to the needs of the modern RV owner, 34 luxury RV sites that will offer the ultimate high-end experience and 23 cottages. Tropical Trails West will offer 175 standard RV sites and 12 cottages.